Reputable open-access publishers not only publish papers on their own sites but also place them in third-party archives, precisely to guard against doomsday scenarios. If (say) PeerJ were made an offer they couldn’t refuse by Elsevier, then the new owners could certainly shut down the PeerJ site; but there’s nothing the could do about the copies of PeerJ articles on PubMed Central, in CLOCKSS and elsewhere. And of course everyone who already has copies of the articles would always be free to distribute them in any way, including posting complete archives on their own websites. Let’s not accept this kind of scaremongering. It’s nearly two years since Alexander Brown wrote Open access: why academic publishers still add value for the Guardian, in which he listed ways that he feels publishers make a contribution. I wrote a lengthy comment in response — long enough that it got truncated at 5000 characters and I had to post a second comment with the tail end. At the time, I intended to turn that comment into an SV-POW! post, but for some reason I never did. Belatedly, here it is. I’m a bit nonplussed by this article, in which a publisher lists a lot of important services that they claim to provide, nearly all of which turn out to be either not important at all (if not actively harmful) or provided for free by academics. Let’s go through them one by one, and see how they measure up against the average cost to academia of $5333 per paywalled academic paper. It is authors who make their work understood. As the author of a dozen published papers myself, I’ve certainly never received any help from an editor to make my work more comprehensible. But even if I had, this would have been done by a handling editor, who is a volunteer academic. to build and maintain the brands and reputations of journals. Journal brands are actively harmful to science. Please stop building and maintaining them. Yes — this, at last, is a real cost in return for a real benefit. This is done by volunteer academics at no cost to the publisher. Yes, editorial board members and reviewers are by and large unpaid. However there are still scores of people whose full time jobs are managing this process for a growing body of scientific literature. This seems more like confession of inefficiency than a claim of achievement. No doubt Google could double the number of managers they have to look after their engineers; but that would hardly result in doubling their output. The real question here should be why traditional publishers feel they need so many staff to do so little. How does this happen? I have never had a publisher help me to find anything. This means sending spam emails inviting researchers to submit to journals. Like everyone else I know, I bin these on receipt. Researchers know what journals they want to publish in, and when they discover new journals it’s by word of mouth from trusted colleagues. Please. This never happens. Authors need to publicise their own work, with or without the help of their institutions, but certainly without significant help from publishers. Often the publisher’s most significant contribution to the publicity process is to release a paper prematurely, thus destroying any attempt at co-ordinating press embargoes. Again, the fact that a publisher spends this much only shows how inefficient they are. There are several free journal-management systems, including Annotum (used by PLOS Currents) and Open Journal Systems (used by 11,500 journals). If publishers don’t use these tools, that’s no reason to charge researchers more. I have no idea what this means. Any open-access journal’s article are always free “whenever they want it”, whatever device someone is reading on. Yes. To pick a well-known large-scale example, it costs arXiv about $7 per paper to accept, host, archive and serve each of its papers indefinitely. A bit less than $5333, admittedly. This is indeed a valuable programme. But it has nothing to do with ongoing publishing, and is a red herring in the current discussion. for OA authors Springer deposits a researcher’s work into the institutional repositories these scientists are often required to use, helping to provide further access to scholarly works. This is good. It saves the author a good fifteen minutes. £5333 well spent! On the contrary: it’s hard to understand how publishers manage to do it so inefficiently. I just find all this baffling. Any researcher who has actually been through the process of publication knows that it is researchers who do all the significiant work: not only the research, but the writing, the preparation of illustrations, the editorial process, the peer-reviewing, the copy-editing, and increasingly even the typesetting. Hosting, archiving and replication can be done for $7 per paper. So I still don’t see where the publishers are adding any value that is of value to the academy. Last night, I did a Twitter interview with Open Access Nigeria (@OpenAccessNG). To make it easy to follow in real time, I created a list whose only members were me and OA Nigeria. But because Twitter lists posts in reverse order, and because each individual tweet is encumbered with so much chrome, it’s rather an awkward way to read a sustained argument. So here is a transcript of those tweets, only lightly edited. They are in bold; I am in regular font. Enjoy! So @MikeTaylor Good evening and welcome. Twitterville wants to meet you briefly. Who is Mike Taylor? Sorry for the long answer, I will try to be more concise with the next question! Ok @MikeTaylor That’s just great! There’s been so much noise around twitter, the orange colour featuring prominently. What’s that about? Actually, to be honest, I’m not really up to speed with open-access week (which I think is what the orange is all about). I found a while back that I just can’t be properly on Twitter, otherwise it eats all my time. So these days, rather selfishly, I mostly only use Twitter to say things and get into conversations, rather than to monitor the zeitgeist. In the end I suppose open-access week doesn’t hit my buttons too strongly because I am trying to lead a whole open-access life. You’re welcome @MikeTaylor. So what is open access? Open Access, or OA, is the term describing a concept so simple and obvious and naturally right that you’d hardly think it needs a name. It just means making the results of research freely available on the Internet for anyone to read, remix and otherwise use. You might reasonably ask, why is there any other kind of published research other than open access? And the only answer is, historical inertia. For reasons that seemed to make some kind of sense at the time, the whole research ecosystem has got itself locked into this crazy equilibrium where most published research is locked up where almost no-one can see it, and where even the tiny proportion of people who can read published works aren’t allowed to make much use of them. So to answer the question: the open-access movement is an attempt to undo this damage, and to make the research world sane. Are there factors perpetuating this inertia you talked about? University administrators who make hiring/promotion/tenure decisions based on which old-school journals a researcher’s papers are in. Feeble politicians who think it’s important to keep the publishing sector profitable, even at the expense of crippling research. I’m sure there are plenty of others who I’ve overlooked for the moment. I always say regarding this that there’s plenty of blame to go round. So these publishers who put scholarly articles behind paywalls online, do they pay the researchers for publishing their work? Oh, sorry, please excuse me while I wipe the tears of mirth from my eyes. An academic publisher? Paying an author? Hahahahaha! No. Not only do academic publishers never pay authors, in many cases they also levy page charges — that is, they charge the authors. So they get paid once by the author, in page-charges, then again by all the libraries that subscribe to read the paywalled papers. Which of course is why, even with their gross inefficiencies, they’re able to make these 30-40% profit margins. So @MikeTaylor why do many researchers continue to take their work to these restricted access publishers and what can we do about it? Part of it is just habit, especially among more senior researchers who’ve been using the same journals for 20 or 30 years. Which is wrong-headed on so many levels. First of all, they should be looking at the work itself, and making an assessment of how well it was done: rigour, clarity, reproducibility. But it’s much easier just to count citations, and say “Oh, this has been cited 50 times, it must be good!” But of course papers are not always cited because they’re good. Sometimes they’re cited precisely because they’re so bad! For example, no doubt the profoundly flawed Arsenic Life paper has been cited many times — by people pointing out its numerous problems. But wait, it’s much worse than that! Lazy or impatient administrators won’t count how many times a paper has been cited. Instead they will use a surrogate: the Impact Factor (IF), which is a measure not of papers but of journals. Roughly, the IF measures the average number of citations received by papers that are published in the journal. So at best it’s a measure of journal quality (and a terrible measure of that, too, but let’s not get into that). The real damage is done when the IF is used to evaluate not journals, but the papers that appear in them. And because that’s so widespread, researchers are often desperate to get their work into journals that have high IFs, even if they’re not OA. So we have an idiot situation where a selfish, rational researcher is best able to advance her career by doing the worst thing for science. This is actually all so enlightening. You just criticised Citation Index along with Impact Factor but OA advocates tend to hold up a higher Citation Index as a reason to publish Open Access. What do you think regarding this? I think that’s realpolitik. To be honest, I am also kind of pleased that the PLOS journals have pretty good Impact Factors: not because I think the IFs mean anything, but because they make those journals attractive to old-school researchers. In the same way, it is a well-established fact that open-access articles tend to be cited more than paywalled ones — a lot more, in fact. So in trying to bring people across into the OA world, it makes sense to use helpful facts like these. But they’re not where the focus is. So @MikeTaylor Institutions need to stop evaluating research papers based on where they are published? Do you know of any doing it right? I’m afraid I really don’t know. I’m not privy to how individual institution do things. What are the various ways researchers can make their work available for free online? First, you can post your papers on preprint servers. The best known one is arXiv, which now accepts papers from quite a broad subject range. For example, a preprint of one of the papers I co-wrote with Matt Wedel is freely available on arXiv. There are various preprint servers, including arXiv for physical sciences, bioRxiv, PeerJ Preprints, and SSRN (Social Science Research Network). You can put your work on a preprint server whatever your subsequent plans are for it — even if (for some reason) it’s going to a paywall. There are only a very few journals left that follow the “Ingelfinger rule” and refuse to publish papers that have been preprinted. So preprints are option #1. Number 2 is Gold Open Access: publishing in an open-access journal such as PLOS ONE, a BMC journal or eLife. As a matter of principle, I now publish all my own work in open-access journals, and I know lots of other people who do the same — ranging from amateurs like me, via early-career researchers like Erin McKiernan, to lab-leading senior researchers like Michael Eisen. There are two potential downsides to publishing in an OA journal. One, we already discussed: the OA journals in your field may not be be the most prestigious, so depending on how stupid your administrators are you could be penalised for using an OA journal, even though your work gets cited more than it would have done in a paywalled journal. The other potential reason some people might want to avoid using an OA journal is because of Article Processing Charges (APC). Because OA publishers have no subscription revenue, one common business model is to charge authors an APC for publishing services instead. APCs can vary wildly, from $0 up to $5000 in the most extreme case (a not-very-open journal run by the AAAS), so they can be offputting. There are three things to say about APCs. First, remember that lots of paywalled journals demand page charges, which can cost more! But second, please know that more than half of all OA journals actually charge no APC at all. They run on different models. For example in my own field, Acta Palaeontologica Polonica and Palaeontologia Electronica are well respected OA journals that charge no APC. And the third thing is APC waivers. These are very common. Most OA publishers have it as a stated goal that no-one should be prevented from publishing with them by lack of funds for APCs. So for example PLOS will nearly always give a waiver when requested. Likewise Ubiquity, and others. So there are lots of ways to have your work appear in an OA journal without paying for it to be there. And #3 is “Green OA”, which means publishing in a paywalled journal, but depositing a copy of the paper in an open repository. The details of how this works can be a bit complicated: different paywall-based publishers allow you to do different things, e.g. it’s common to say “you can deposit your peer-reviewed, accepted but unformatted manuscript, but only after 12 months“. Opinions vary as to how fair or enforceable such rules are. Some OA advocates prefer Green. Others (including me) prefer Gold. Both are good. See this SV-POW! post on the practicalities of negotiating Green OA if you’re publishing behind a paywall. I’ve written absolutely shedloads on these subjects over the last few years, including this introductory batch. If you only read one of my pieces about OA, make it this one: The parable of the farmers & the Teleporting Duplicator. Last question – Do restricted access publishers pay remuneration to peer reviewers? I know of no publisher that pays peer reviewers. But actually I am happy with that. Peer-review is a service to the community. As soon as you encumber it with direct financial incentives, things get more complicated and there’s more potential for Conflict of interest. What I do is, I only perform peer-reviews for open-access journals. And I am happy to put that time/effort in knowing the world will benefit. And so we bring this edition to a close. We say a big thanks to our special guest @MikeTaylor who’s been totally awesome and instructive. Thanks, it’s been a privilege. In light of yesterday’s tutorial on choosing titles, here are the titles of all my own published papers (including co-authored ones), in chronological order, with my own sense of whether I’m happy with them now I look back. All the full references are on my publications page (along with the PDFs). I’ll mark the good ones in green, the bad ones in red and the merely OK in blue. The Phylogenetic Taxonomy of Diplodocoidea (Dinosauria: Sauropoda). OK, I suppose. It does at least clearly state what the paper is about. I’ll give myself a pass on this since it was my very first paper. Dinosaur diversity analysed by clade, age, place and year of description. NOT BAD, since the paper was basically a list of many, many results that could hardly have been summarised in the title. I give myself some points for listing the ways I analysed the data, rather than just saying “An analysis of dinosaur diversity” or something equally uninformative. Phylogenetic definitions in the pre-PhyloCode era; implications for naming clades under the PhyloCode. NOT BAD again, I suppose, since it was a discussion paper that couldn’t be summarised in a short title. Could I have said what the alluded-to implications are? I think probably not, in a reasonably concise title. An unusual new neosauropod dinosaur from the Lower Cretaceous Hastings Beds Group of East Sussex, England. RUBBISH, since it doesn’t name the new dinosaur (which was of course Xenoposeidon). I was young and stupid back then, and just followed convention. In mitigation, it does at least say when and where the specimen is from. Case 3472: Cetiosaurus Owen, 1841 (Dinosauria, Sauropoda): proposed conservation of usage by designation of Cetiosaurus oxoniensis Phillips, 1871 as the type species. DOUBLE-PLUS UGLY. But I am going to blame the journal on this one — they have a very firmly defined format for petition titles. Head and neck posture in sauropod dinosaurs inferred from extant animals. RUBBISH. What was I thinking, and why did my SV-POW!sketeer co-authors let me choose such an uninformative title? We should of course have gone with a title that says what posture we inferred. The associated blog-post had a much better title: Sauropods held their necks erect … just like rabbits. A re-evaluation of Brachiosaurus altithorax Riggs 1903 (Dinosauria, Sauropoda) and its generic separation from Giraffatitan brancai (Janensch 1914). ADEQUATE, since the title strongly implies the conclusion (generic separation) even if doesn’t quite come out and say it. Electronic publication of nomenclatural acts is inevitable, and will be accepted by the taxonomic community with or without the endorsement of the Code. BRILLIANT. The best title in my CV. You hardly even need to read the paper once you’ve read the title. The only downside: it’s 12 characters too long to tweet. Sharing: public databases combat mistrust and secrecy. GOOD, but I can’t take the credit for that (A) because I was third author behind Andy Farke and Matt, and (B) because the journal chose the title. OK, but we should have done better. Something like “The Open Dinosaur Project recruits volunteer effort to analyse dinosaur evolution”. Or, if we were being honest (and prescient), “The Open Dinosaur Project will lie embarrassingly moribund for more than two years”. Sauropod dinosaur research: a historical review. Running a question-and-answer website for science education: first hand experiences. UNOBJECTIONABLE, but not my choice anyway — lead author Dave Hone presumably picked it. Could have done better by stating what at least one of those experiences was. A new sauropod dinosaur from the Lower Cretaceous Cedar Mountain Formation, Utah, USA. RUBBISH. At least this time it wasn’t entirely my fault. When we submitted this to Acta Palaeontologica Polonica, it was called “Brontomerus mcintoshi, a new sauropod dinosaur from the Lower Cretaceous Cedar Mountain Formation, Utah, USA”, but the journal made us take the taxon name out of the title. Why? Why why WHY? The long necks of sauropods did not evolve primarily through sexual selection. Why sauropods had long necks; and why giraffes have short necks. EXCELLENT. Short, appealing and (hopefully) funny. When I give talks based on this paper, I use the even better short version, just “Why giraffes have short necks”. But that seemed a bit too cute for an academic setting. Neural spine bifurcation in sauropod dinosaurs of the Morrison Formation: ontogenetic and phylogenetic implications. WEAK. We should have stated the conclusion: a title like “Neural spine bifurcation in sauropods of the Morrison Formation is not an ontogenetic feature, but is phylogenetically significant” would have been better. The neck of Barosaurus was not only longer but also wider than those of Diplodocus and other diplodocines. GOOD. Not particularly exciting, but explicit. Caudal pneumaticity and pneumatic hiatuses in the sauropod dinosaurs Giraffatitan and Apatosaurus. NOT GOOD ENOUGH. We should have stated the main finding: “Caudal pneumaticity and pneumatic hiatuses reveal cryptic diverticula in the sauropod dinosaurs Giraffatitan and Apatosaurus“. The effect of intervertebral cartilage on neutral posture and range of motion in the necks of sauropod dinosaurs. UGH, rubbish. What the heck was I thinking? I should have written this post a couple of years ago, and used it to make me choose a much better title. As it is, it just leaves the reader assuming intervertebral cartilage probably has some effect, but they have no idea what. I make that six good titles, seven bad ones and six indifferent. Awarding two points per good title and one per adequate title, I give myself 18 points out of a possible 38 — slightly less than half, at 47%. More worryingly, there’s no apparent trend towards choosing better titles. As a browser, I often want a take home message. This isn’t helped by the weak title, which represents most of your communication effort. “Studying the effect of” in a title is bland and uninformative. Every academic thing is “studying the effect of” something. A question would be better, and an answer would be better still. I think that’s right on target. Unfortunately, we in palaeo are mired in an ancient tradition of uninformative paper titles. We look at Cope’s three indistinguishable 1877 titles “On a dinosaurian from the Trias of Utah”, “On a gigantic saurian from the Dakota epoch of Colorado” and “On Amphicoelias, a genus of saurian from the Dakota epoch of Colorado” and assume that’s the way to do it. Or his 1878 titles, “On the Vertebrata of the Dakota Epoch of Colorado” and “On the saurians recently discovered in the Dakota Beds of Colorado”. It’s in tribute to uninformative titles such as these that I stupidly titled my dissertation “Aspects of the history, anatomy, taxonomy and palaeobiology of sauropod dinosaurs”. The cover of the printed version of my dissertation. Proof that I can pick a useless title just as well as E. D. Cope. So what makes a good title? Here’s a rather random list of thoughts. Feel free to chip in with others that I missed. Give the name of the taxon under study. Stupidly, lots of journals have a rule that says a paper naming a new taxon can’t use the new name in the title. I can’t begin to imagine why anyone thinks it’s a good idea to make sure that the title is missing the Single. Most. Important word, but there it is. Avoid vague words like “study”, “aspects”, “observations”, etc. Instead, choose a title that tells us what you studied, what aspects were of interest, and what you observed. Avoid weak puns. Don Henderson’s paper on sauropod step sequences got away with being called “Burly Gaits” because it was a clever double pun; but only just, as it had nothing to do with the Pearly Gates. It’s best not to attempt this unless you have something really smart. In fact avoid all jocular references to well-known phrases, because they’re lame. 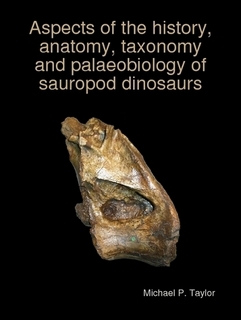 Really, how does the introductory phrase improve titles like “Not just a pretty face: anatomical peculiarities in the postcranium of Rebbachisaurids (Sauropoda: Diplodocoidea)” or “The eyes have it: the sizes, shapes, and orientations of theropod orbits as indicators of skull strength and bite force”? Ask a question. For example, Roland T. Bird’s 1944 paper on the terrestrial/aquatic sauropod controversy was called “Did Brontosaurus ever walk on land?” More recently, Bonnan and Senter asked in 2007, “Were the basal sauropodomorph dinosaurs Plateosaurus and Massospondylus habitual quadrupeds?” A question draws people in. The underlying principle here is this: for many people, the title will be the only part of your paper that they ever read. For many more, it will be the part that draws them in to read more — something they won’t do if the title doesn’t draw them in. So, for the benefit for the first group, you want to write a title that will stand as a not-completely-inadequate surrogate for the whole paper. And you also want that title to provoke the interest of the second group. UPDATE: Mike and Matt review their own paper titles here and here, respectively. This arrived on my Facebook wall, courtesy of Raul Diaz. For a split second I really did think the one second from the right was an older-model Carnegie Brachiosaurus toy. I assume that, like me, you have people in your life that you don’t correspond with very often, and when you remember that they exist, it just makes you happy. Like, yeah, there’s a slightly higher chance that our species is going to make it, just because that person is out there in the world, doing what they do. Raul is in that category for me. He’s a herpetologist, but that term doesn’t really do him justice; Raul is into herps like Genghis Khan was into real estate acquisition. Now he’s an Assistant Professor at La Sierra University and also teaches at the Loma Linda University School of Medicine (Raul, that is, not Genghis Khan). But I’ve known him since he was an undergrad. He was a student in one of my discussion sections for the evolution course at Berkeley. I had a tradition in all the classes I taught as a grad student: on the last class meeting I’d have people bring food and we’d have a little potluck. Raul showed up with a six-pack of Pabst Blue Ribbon. No-one else was partaking, so Raul and I spent 50 minutes drinking PBR and talking about descent with modification. Good times. 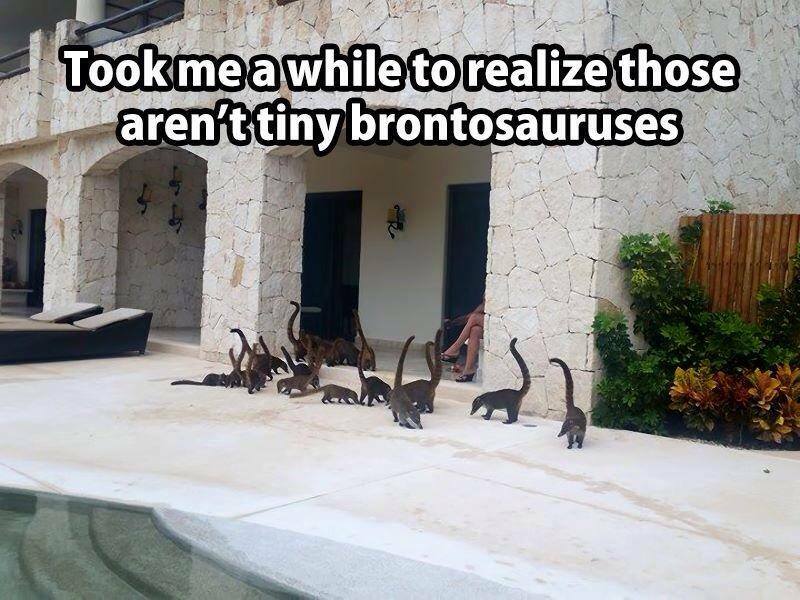 Oh, and the “tiny brontosauruses” are actually coatis, genus Nasua, raccoon relatives that range from the southwestern US to northern South America. 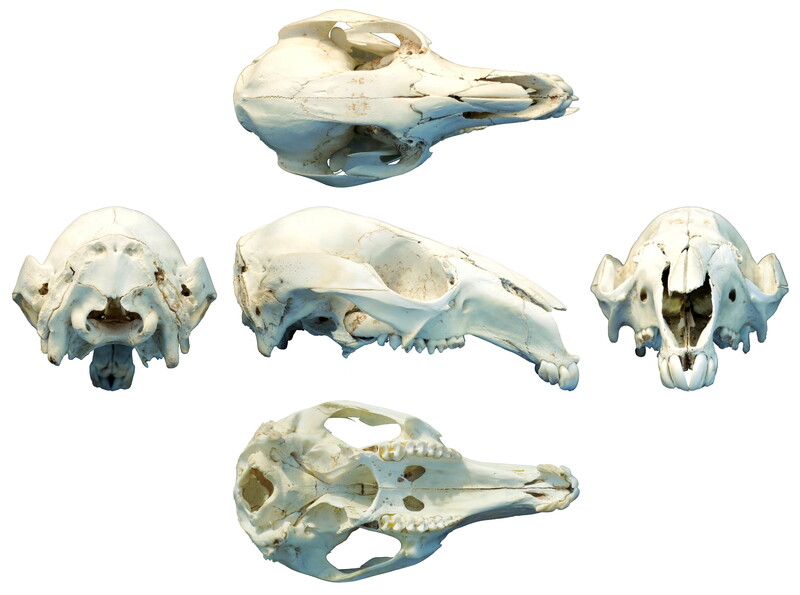 Surprisingly, I don’t think that Darren has ever covered coatis in detail at TetZoo; maybe this will spur him into action. As always, click through for the full-sized version (6833 × 5082).